Habit: Ipomoea hederifolia grows as an annual vine. The leaves are arranged alternately, to 15 cm in length, ovate to orbicular. The leaf margin ranges from entire, dentate to 5-7 lobed with an acute to acuminate leaf apex. The actinomorphic flowers are arranged in cymes or solitary. The calyx has 5 green, unfused, filiform sepals. 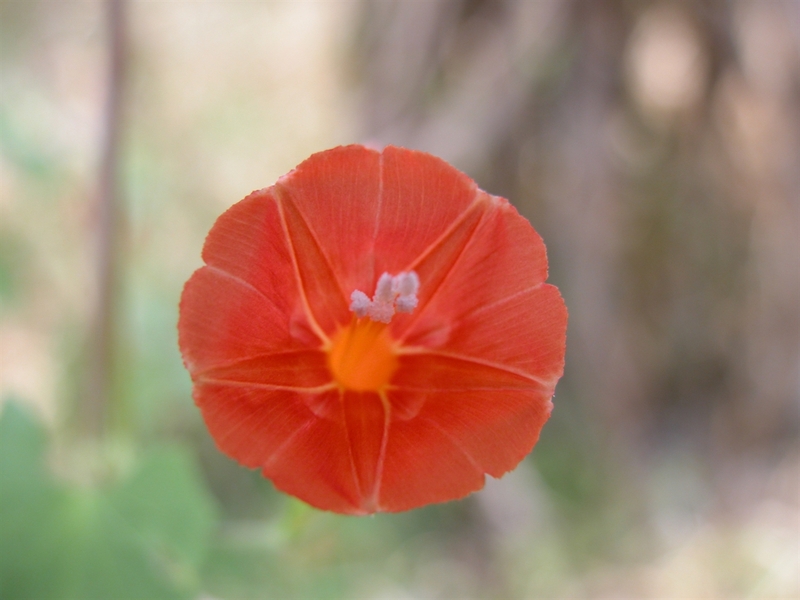 The corolla has 5 fused, red to yellow petals that form a salverform tube that is often recurved. There are 5 stamens fused to the throat of the corolla tube and at the point of attachment are numerous hairs. The ovary is superior with 3 locules and numerous seeds. The fruit is a capsule at maturity. Distribution in Bahamas/Globally: Ipomoea hederifolia occurs in the northern island groupings of the Bahamian Archipelago. It is now distributed through out the topical and subtropical areas of the world. Medicinal/Cultural/Economic usage: Ipomoea hederifolia is not used medicinally in the Bahamas. Ipomoea hederifolia is used in the horticultural industry.